OMG OMG OMG!!! Now this is a bag. It's got to be the most perfect summer tote for all those steamy summer city walks.... or for going to the farmer's market to pick up some fresh produce for dinner... or or or... to pack up your bathing suit, beach towel and trashy magazines then head out to the beach... gosh i love this bag!... and with only 13 days to my birthday I think i just found my present to myself. I LOVE this bag! 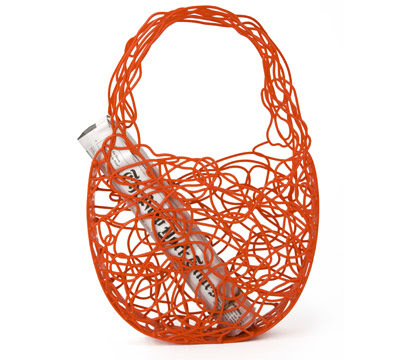 Named the Corallo Bag, by Humberto and Fernando Campana, 2008. Here's the description from The MoMA Store. "Featuring a design inspired by the Campana Brothers' innovative Corallo armchair, this remarkable bag features a spiraling shape that is meant to evoke coral branches. The bag was created in conjunction with Brazilian brand Melissa, known for their innovative uses of plastic. Made of floral-scented PVC." May 14, 2009 by Hey There!